The Coca-Cola polar bears love football. In fact, in addition to starring in three new commercials, they are tuned into NBC’s broadcast – just like millions of fans around the world and sharing their reactions to all the in-game action, ads and halftime show via a live digital stream. For this year’s big game, Coca-Cola has launched CokePolarBowl.com, a unique viewing experience for fans that merges a live digital stream and social media with traditional television advertising. The stars of the campaign are two Coca-Cola polar bears who will be watching the game live and sharing a Coke from the comforts of their Arctic ice cave. The live stream will showcase the animated polar bears’ reactions to all the plays on the field, the halftime show and highly anticipated commercials. Fans will be able exchange tweets with the polar bear using the hashtag #GameDayPolarBears and share select moments from the live stream with friends via social media. While the two polar bears are both football fans, they are rooting for opposing teams, adding to the fun of watching their expressions of delight or frustration as the game unfolds. 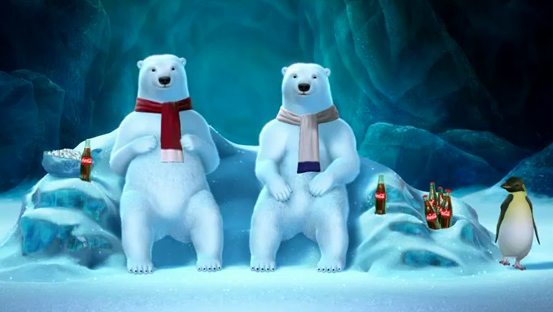 Throughout the live stream a variety of ancillary characters, including penguins and a young polar bear stop by the bears’ snow cave to share a Coke and enjoy the festivities. Fun moments in the live stream include the penguins’ interpretation of “planking”, penguins dancing and polar bears sharing their favorite fan responses from the twitter feed. During the game, animators control the bears and their environment using a combination of traditional video gaming controllers and a proprietary PC-based interface. You can watch the Super Bowl 2012 along with the Coca-Cola Polar bears here.